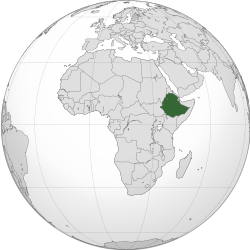 Ethiopia is a country in the Horn of Africa. It has one of the most well known histories as a country in Africa and the world. Unlike other African countries, Ethiopia stayed together during the Scramble for Africa, except for 5 years when it was ruled by Italians. Ethiopia used to be called Abyssinia. The word "Ethiopia" is from the Greek word Αἰθιοπία meaning sun light burned face. BNP per capita 1370 $ (IMF) (2008). During the rule of Emperor Lebna Dengel, Ethiopia made its first good contact with a European country, Portugal. This was a good development. When the Empire was attacked by Somali General and Imam, Ahmad ibn Ibrihim al-Ghazi, Portugal responded to Lebna Dengel's request for help with an army of 400 men, which helped his son Gelawdewos beat al-Ghazi and remake his rule. However, Jesuit missionaries over time offended the Orthodox faith of the local Ethiopians, and in the mid-17th century Emperor Fasilidos got rid of these missionaries. At the same time, the Oromo people began to question the Ethiopian Christian authorities in the Abyssinian territories, and wanted to keep their own religion. All of this led to Ethiopia's isolation during the 1700s. The Emperors became figureheads, controlled by warlords like Ras Mikael Sehul of Tigray. Ethiopian isolationism ended following a British mission that made friendship between the two nations; however, it was not until the reign of Tewodros II that Ethiopia began to take part in world matters once again. ↑ "Ethiopian Constitution". Article 5 Ethiopian constitution.. APAP. http://www.apapeth.org/Documents/EthiopianLaws.html. Retrieved 3 December 2011. ↑ 4.0 4.1 4.2 4.3 "Ethiopia". International Monetary Fund. http://www.imf.org/external/pubs/ft/weo/2011/01/weodata/weorept.aspx?pr.x=52&pr.y=2&sy=2008&ey=2011&scsm=1&ssd=1&sort=country&ds=.&br=1&c=644&s=NGDPD%2CNGDPDPC%2CPPPGDP%2CPPPPC%2CLP&grp=0&a=. Retrieved 2011-04-21. This page was last changed on 24 July 2014, at 07:47.